Form I-765 can be used to request an employment authorization document (EAD), by some foreign nationals who are in the U.S. for a limited amount of time and are eligible to work. The EAD is also referred to as a work permit. Form I-765 consists of 2 page with 19 numbered blanks to fill out. Your answers should be typed on Form I-765, if possible. If not, write your answers neatly in black ink. If your answer for any question is none or the question is not applicable to you, USCIS wants you to write “none” or “N/A” in the appropriate blank. You can use extra sheets of paper if your answers will not fit in the spaces provided. You must fill out the form completely and honestly or risk having your application delayed or denied. The most recent edition date of Form I-765 is 01/17/17. Beginning on 02/21/17, USCIS will no longer accept any previous editions. If your application is postmarked 12/23/16 or later, you must include the new fees or your form will be rejected. The edition date can be found at the bottom left-hand corner of each page of the form and its instructions. Once your form has been received, USCIS will check it for completeness and accuracy. You then may be called to appear at USCIS to provide more evidence, participate in an interview, or submit to the collection of biometrics, including fingerprints, photograph, and signature. Collect all the documents you might need to answer the questions (i.e. passport, birth certificate, Social Security card, if any) and find a quiet work space where you will not be disturbed. Allow yourself plenty of time to read and understand the questions. Note that both Form I-765 and the corresponding USCIS instructions, are printed in columns. When you have finished reading the left-hand column on a page, move back to the top of that page to continue reading the right-hand column before moving to the next page. Now that you’re ready to fill out Form I-765, let’s go through it step by step so that you don’t miss anything important. Directly underneath the box labeled “For USCIS Use Only,” you will be asked to check a box describing why you are filling out this form. Numbers 1-8 are all self-explanatory, asking for information such as your name, address, and date and place of birth. Number 9 asks you to list every Social Security number you have used, even if it was not assigned to you. In Number 10, enter your Alien Registration Number (A-number), if you have one. It will be the 8 or 9-digit number following the ‘A’ on any correspondence you have received from USCIS. If you don’t have an A-number, write in your I-94 number, if you have one. This is your Arrival/Departure Record number. This number can be found online at https://i94.cbp.dhs.gov/I94 if you came to the United States by ship or plane after April 2013. You will need your passport number to access it. If you came to the U.S. prior to April 2013, a white I-94 card containing your number might be found stapled to your passport. If you changed status while in the U.S., your I-94 was with your approval notice. If you have been given more than one I-94 number, always use the last one you received. You will not have an I-94 number if you came to the U.S. without documentation or by automobile as a Canadian tourist. Numbers 12, 13, and 14 refer to the date, place, and status of your last entry into the U.S. Number 15 asks for your current immigration status. If you know the visa category, you may use that. If not, describe your category (i.e. student, visitor, etc.). If you currently have no legal status, you must write that in the blank. Number 16 is the most complicated question on the form. You will need to look through the “Who May File Form I-765?” section of the instructions to determine your eligibility category. You will notice 3 sets of open parentheses to write in. Start filling in the parentheses to the far left (at arrow). If your category only has 2 letters/numbers- for instance, (c)(9)- you will leave the set of parentheses to the far right empty. If you answered (c)(35) or (c)(36) for Number 16, Number 19.a. asks you to write in the receipt number of the Form I-140 beneficiary’s Form I-797 Notice of Approval for Form I-140. For 19.b., you must check the box corresponding to the correct answer for the question, “Have you EVER been arrested for and/or convicted of any crime?” Note the special instructions for anyone who answers “yes” to 19.b. On the right-hand side of page 2 is an area for you sign, date, and provide your phone number. 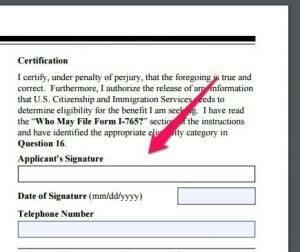 By doing so, you are certifying that you have answered all of the questions truthfully, that you give USCIS permission to release any of the information you have given them in their effort to determine your eligibility for the EAD, and that you have written the appropriate eligibility category for Number 16. Under the blank for your phone number, is another area to be used by the person preparing this form (if it was someone other than you). He or she will need to sign, date, print their name, and write their address. By doing so, they are declaring that they prepared the document based on information you gave them. You will need to complete the Form I-765 worksheet if you are applying for your EAD under the categories Deferred Action (c)(14), or Consideration of Deferred Action for Childhood Arrivals (c)(33). Part 1 has 3 blanks for you to write your last, first, and middle name- in that order. Part 2 has 3 blanks for you to write how much money you make, what your expenses are, and the value of all your current assets. Part 3 gives you space to explain, if you choose to, why you need to apply for work authorization. If you need additional space to complete any answers, you may use an extra sheet of paper to do so. At the top of each sheet of paper you use, write your name and A-Number (if you have one). Also, be sure to indicate which question you are answering by writing the Part and item number on your extra sheet. You must also sign and date each additional sheet. There are some supporting documents that all applicants must submit with their I-765. Other supporting documents may vary depending on which category you are applying under. A copy of the front and back (if available) of your Arrival-Departure Record, Form I-94. This is not required if you are filing Form I-765 under the category (c)(9). More instructions and required supporting documents for special categories can be found on pages 12 through 14 of the Instructions for I-765. The filing fee for Form I-765 is $410 plus a biometrics fee of $85- with some exceptions. 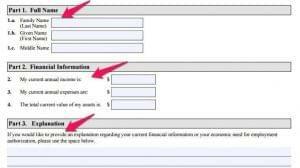 Individuals filing under (c)(9) or (c)(16) Adjustment applicant who applied after July 30, 2007 category must pay the full filing fee, but are not required to pay the biometrics fee. The biometrics fee, however, cannot be waived for this form. All EAD requesters must pay the $85 biometrics fee, including those filing under category (c)(33), Childhood Arrivals. If you must replace your EAD because of wrong information printed on it that is not the fault of USCIS, you must submit a new I-765 with the complete filing and biometrics fee. If the wrong printed information is the fault of USCIS, you must submit a letter and the misprinted EAD to the USCIS center that approved your last work permit. Once you have organized your packet- completed form, I-765 Worksheet (if necessary), fee payment, and supporting documents- you are ready to mail it to USCIS. Where you mail your I-765 packet, will depend on where you live and what your eligibility category is. You can call USCIS National Customer Service Center at 1-800-375-5283 or check the USCIS website at www.uscis.gov/i-765 to get the most accurate and current mailing address. The hearing impaired may contact USCIS at 1-800-767-1833.